Bangkok – Amarin Brand Sale celebrates Mother’s Day with a fabulous chance to look great while you stay in shape with the latest trends in sports apparel and equipment from the most popular international brands at the Amarin Brand Sale: Sports World Sale, Up To 50%, during 7th – 15th August at the Event Hall, 1st floor of Amarin Plaza. 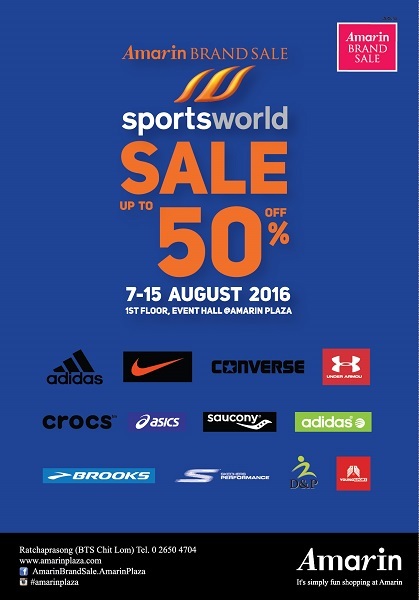 Enjoy discounts of up to 50% and pick up the latest with brands such as Nike, Converse, Under Armou, Crocs, Asics, Saucony, Adidas, Brooks, Skechers Performance, D&P, Young Sport and more — with an additional 5% discount exclusively for Be Smart Member cardholders only (One bill per person, without collecting receipts). Give Mom the sweet surprise she deserves during the Mother’s Day period in Thailand with Amarin’s Healthy Mom, Happy Mom promotion, 10th – 12th August 2016, and win some great prizes for healthy mom. Purchases of just 5,000 baht or more are eligible to join the lucky draw of cash vouchers worth 3,000 baht toward a new pair of sports shoes, the perfect gift for mother, or win a beautiful limited edition happy mug for health. 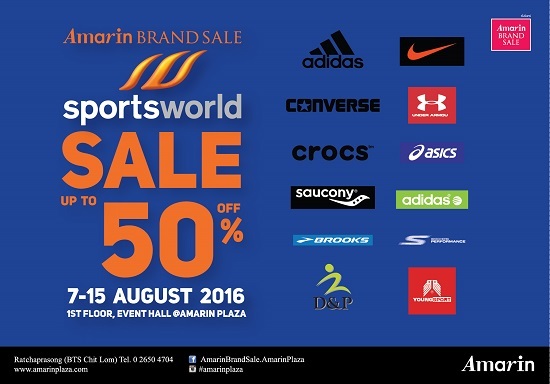 Get in shape and look your best with smart shopping at the Amarin Brand Sale: Sports World sale up to 50% by Amarin Plaza Shopping Center.